PARIS (Reuters) — France's embattled president, Emmanuel Macron, vowed on Monday to press on with his reform agenda in 2019 despite a spate of "yellow vest" protests that have challenged his government and extended a plunge in his approval ratings. Promised overhauls of France's unemployment benefits, civil service and public pensions will be undertaken in the coming year, Macron said in his televised New Year message. Confounding some expectations of a more contrite message, Macron struck an unapologetic note as he urged voters to face up to economic realities underpinning recently enacted reforms of French labour rules, and others yet to come. "In recent years, we've engaged in a blatant denial of reality," Macron said in the address, delivered — unusually — from a standing position in his Elysee Palace office. "We can't work less, earn more, cut taxes and increase spending." In a veiled attack on the far-left and hard-right groupings active on the fringes of the often violent protests, Macron also decried self-appointed "spokespeople for a hateful mob" who he said had targeted foreigners, Jews, gays and the press. Almost 20 months after he became France's youngest president, Macron's popularity is at the lowest level recorded in modern French history. It stood at just 24 per cent in late December compared to 47 per cent a year earlier, according to a Journal du Dimanche aggregate of polls, as he struggled to draw a line under numerous setbacks. 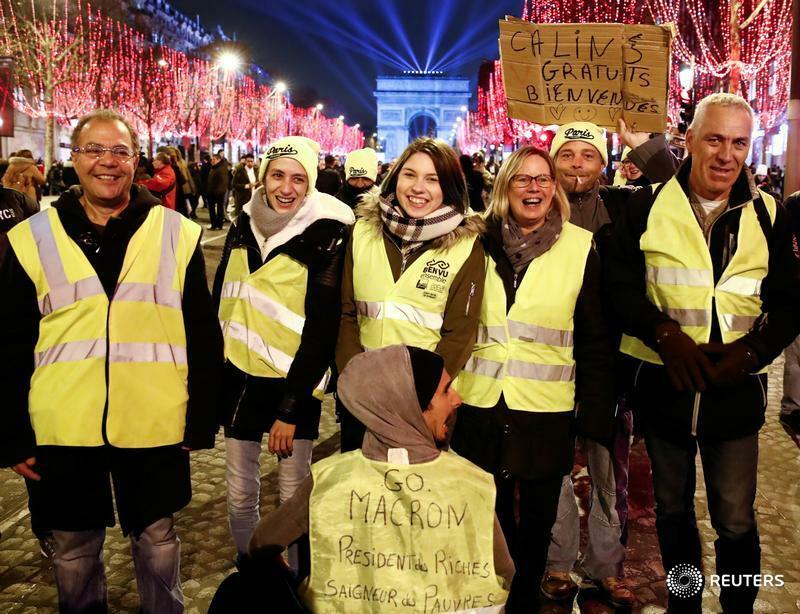 The current wave of demonstrations, which have brought disruption and destruction to Paris and other major cities, has yet to abate despite fiscal giveaways and an increase in the wage for the poorest workers. Protesters were expected to join the New Year crowds thronging Paris's Champs-Elysees Avenue overnight, amid a heavy police presence. A scandal over Macron's former bodyguard Alexandre Benalla, who was eventually fired after video emerged of him beating protestors, has resurfaced with the revelation that he continued to travel on diplomatic passports and exchange messages with Macron long after his dismissal. Macron said efforts to bolster international controls on immigration and tax evasion would be at the heart of European Union proposals he plans to announce in "coming weeks" — to be pursued in parallel with a domestic agenda reconciling ambitious reform with France's commitment to social solidarity. "This is the line I have followed since the first day of my mandate, and which I plan to keep following," he said. "This coming year, 2019, is in my view a decisive one."